Propecia® is its brand name. Finasteride is the generic name and it is a medication widely used for the treatment and prevention of hair loss. But how do you, as a patient, decide whether to take it or not? This blog will help you in your decision making process. Finasteride is primarily a medication for male pattern hair loss. It is not a commonly used medication in females- mainly because there hasn’t been any consistent beneficial effects. The use of finasteride in females may only be limited to conditions like hirsuitism and polycystic ovary syndrome (1). For the majority of males, the main cause of hair loss occurs in a predictable pattern called male pattern baldness. Male pattern baldness is a type of alopecia caused by dihydrotestosterone (DHT), (2). DHT is a hormone converted from testosterone and it works in your scalp to thin your hair and make it fall out. In most men it is the primary driver for hair thinning and hair loss. By stopping the action of DHT at hair follicles, we can stop and reverse the hair loss process. This is how Finasteride works. But should you take it? These positive effects can be see in the first year or two when starting treatment. Interestingly, for those who haven’t noticed a change after a year of taking the medication, you should still continue it. Hair growth in clincial trials have been shown to improve even in those with no or little change after 1 year, with great results in growth after 5 years (2). For patients who do unfortunately suffer from these side effects- rest assured most patients recover well if they stop the medication. Interestingly, some patients recover despite continuing the medication- this suggests that the medication did not cause the side effect in the first place. If you are worried about these side effects it is important you discuss them with your hair loss doctor as there are other treatment options available to you. This includes the option of taking the medication on alternate days. Finasteride is a medication you usually take once a day. The decision to start finasteride really depends on you. If you are concerned about your hair loss and you have been diagnosed with androgenic alopecia (male pattern baldness) then finasteride is a medication that can prevent further hair loss and help you grow thicker hair. If you are planning on having a family soon then Finasteride might not be the medication you choose to have. Other treatment options like Minoxidil could be your first line treatment. After you have finished having children you can then think about adding in or swapping to Finasteride. Some patients may also benefit from having Finasteride to stabilise their existing hair loss before choosing to have a hair transplant. By stopping the progression of hair loss and helping to thicken hair in previously thin areas many patients are able to achieve a very good aesthetic outcome. If they then wanted to have a hair transplant the total number of grafts required for a desirable outcome is less. Overall, the combination of finasteride and a hair transplant to reverse and treat hair loss is the most effective treatment. If you would like to find out more about Finasteride then please don’t hesitate to contact our hair loss specialists at The Treatment Rooms London. Our Surgeons and Doctors are happy to take you through a full consultation around hair loss, including a discussion about Finasteride. Feel free to book your consultation today. John Travolta recently embraced being fully bald- posting a picture on Instagram of him “rocking the look”. And recently in the news an MP was unfortunately “ridiculed” for wearing a wig in the House of Commons. With an increasing number of gentleman looking for hair loss treatment- at what point do you embrace baldness? Becoming bald is a natural process of ageing. For decades we have looked for the one and ultimate cure for hair loss. With FDA and MHRA-approved treatments like Finasteride and Minoxidil; there are proven hair loss treatments for both men and women. At what stage would you say you are bald? 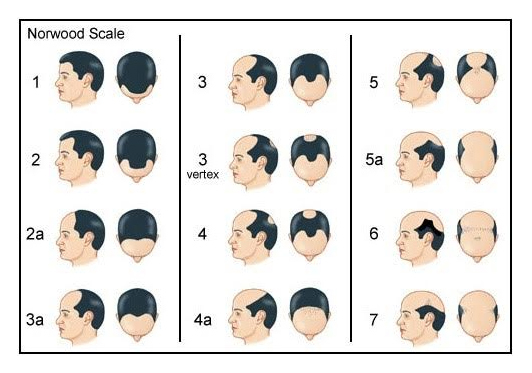 Baldness has several different stages- as represented by the Norwood Scale for men (picture blow). We would describe complete baldness as stage 5a-7, where you have lost all of your hair on the top of your head (if you are male). However, at each stage you can describe yourself as going bald. If you decided to start hair loss treatment when you at stages 1-5 there is a good chance of being able to restore your hair on the top and crown. The choice of your treatment will depend on a number of factors. Ideally a combination of finasteride, minoxidil and hair transplantation could be an option for you. Embracing baldness- what does this mean? Some gentlemen who we find coming to The Treatment Rooms London are content with not undergoing treatment for their hair loss. They would prefer to style out their baldness. At The Treatment Rooms we have always been led by our patients on their preference for treatment or not. If you prefer being bald and it suits you then why would you bother choosing to have treatment? Embracing baldness is more a paradigm shift in thinking and perception than it is acceptance. Acceptance suggests that becoming bald wasn’t a choice but it just happened without giving you the chance to do something about it. In reality, there are so many treatments now available that in the 21st century you now have a choice about whether to embrace baldness or not. A medication that helps to stop any more hair loss and freeze-frame your existing hair loss pattern. Who is on this treatment? Donald Trump’s famous hair has always caught the media headlines. It is widely rumoured that Donald Trump takes Finasteride. Not convinced of his results? 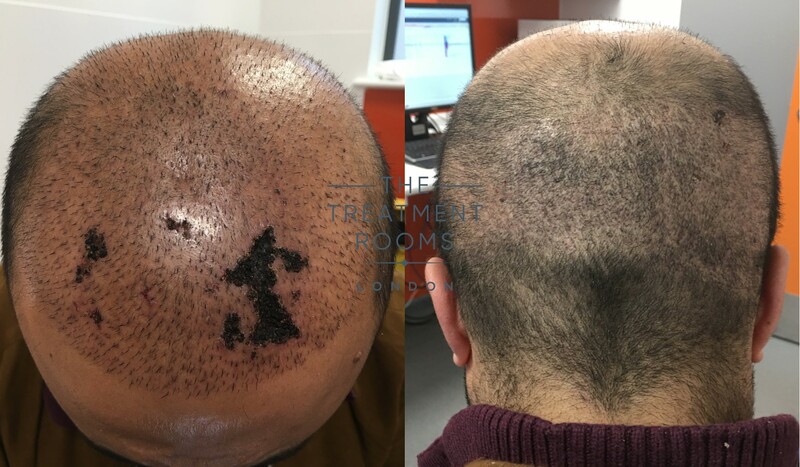 Check out some of the hair regrowth results we have managed to achieve at The Treatment Rooms London in our gallery (click here). This a solution, shampoo or spray you apply to your hair. It helps to promote the blood supply to your hair and makes your hair thicker.